This entry was posted in FR and tagged nouvelles on May 1, 2013 by FEMEN. 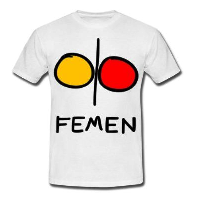 This entry was posted in EN and tagged news on May 1, 2013 by FEMEN. This entry was posted in ES and tagged noticias on May 1, 2013 by FEMEN. This entry was posted in TR and tagged haber on May 1, 2013 by FEMEN. Pour le recrutement de FEMEN NOIRES ET MUSULMANES !